In short, words or definitions can't do this diversity justice, which is why we'll be using lots of pictures and easier to understand (and more entertaining!) video clips from depictions of autistic traits in the media. After learning the basic vocabulary and characteristics of autism and watching the videos in the General Idea portion, I guarantee you'll have a more fleshed out understanding of autism than if you'd spent that same amount of time trying to understand the official take on autism. In discussions of autism, two seemingly odd words will come up frequently in conversation - the autism umbrella and the autism spectrum. The autism umbrella exists because autism is actually one of many disorders with similar characteristics. These disorders are known as pervasive developmental disorders, and are not, as they are mistaken to be, mental illnesses. The disorders have been changed recently (the changes will go into effect in May), and many of them have been grouped under the general name autism. Why, then, am I introducing you to this? One reason is that people already diagnosed may find it beneficial to differentiate between the different disorders. One of the more common instances of this is the diagnosis of Asperger's Disorder as opposed to Autistic Disorder. People previously diagnosed with Asperger's Disorder are verbal, and their IQs are generally above average - think Einstein. In short, it's a diagnosis that carries less stigma than classic autism, and many are likely continue distinguishing between Asperger's and Autistic Disorder. 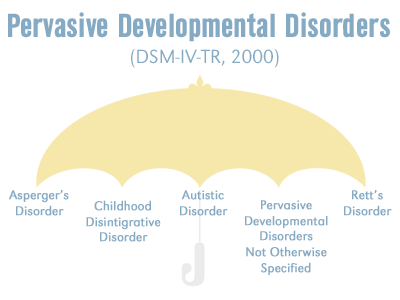 The other reason it's a good idea to understand the pervasive developmental disorder (PDD) umbrella is because it's a foundation for understanding the autism spectrum. No two people are alike, and nowhere is that more true than on the autism spectrum, particularly now that all of the different pervasive developmental disorders have been lumped together. You may have someone who's completely non-verbal, doesn't socialize well, and has a low IQ score (which doesn't necessarily mean they're not intelligent, but that's an argument for another section). On the other hand, you might have someone who's extremely verbal, mostly succeeds at socializing with others, and is a genius even according to our testing methods. Both are equally autistic, but they fall on very different ends of the autism spectrum. There are also a great many people who fall somewhere in between the two. Because of this spectrum, people with autism are often referred to as being people with autism spectrum disorders, or ASD for short. Finally, it's been argued that there is, in fact, a spectrum within the spectrum. For instance, in the case above, someone on the autism spectrum might be labeled "severely autistic" or "low functioning," but in fact have an extremely high mental capacity. Because of the spectrum and the autism umbrella, it's extremely difficult to generalize about autistic people, which is why I labeled the thought that we can generalize about people with autism to be the ultimate myth. Thanks to the diversity of people with autism, if you know one person with autism, you know one person with autism, and that's about it. When we learn about any disorder, our first instinct tends to be to check the symptoms. 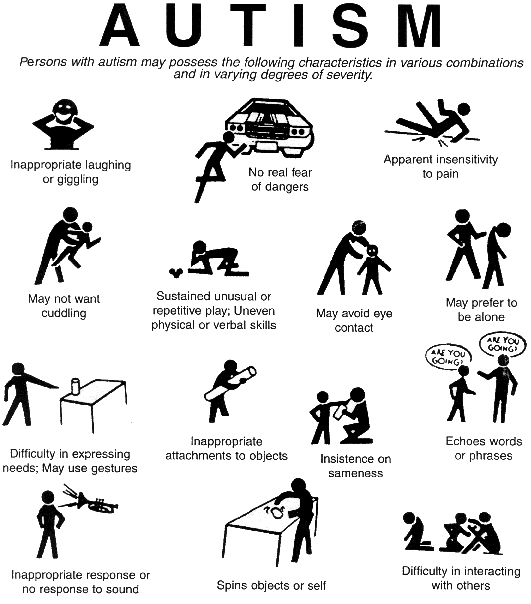 Here is a chart of the characteristics people with autism tend to possess. 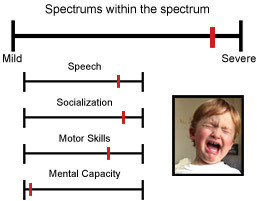 Out of all the sentences on that diagram, though, I hope this was the one you paid attention to most - "persons with autism may possess these characteristics in various combinations and in varying degrees of severity." Not everyone will have these traits, and even if they do they may only display them to a minor degree (depending on where they fall on the autism spectrum). To use my sister, who does have high functioning autism, for an example, she loves cuddling, never displayed echolalia (echoing words or phrases) and isn't particularly fond of spinning. 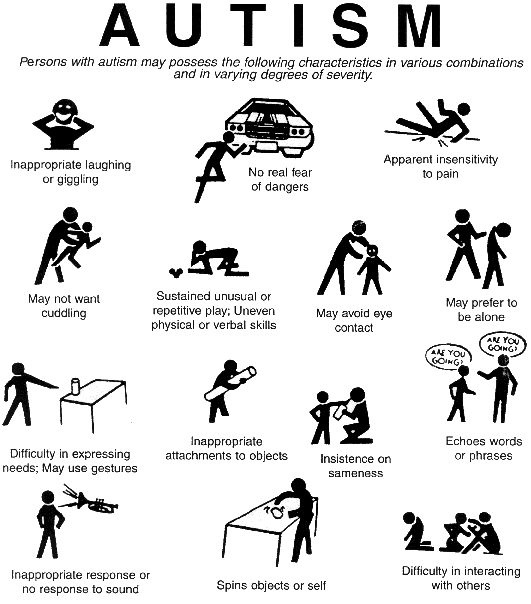 The point of giving you this chart was to give you an idea of some basic characteristics that many autistic people exhibit, but as always, it's important to keep in mind that everyone with autism is different. Now that we've covered the more formal definition, let's move on to something more informal - portrayals of autism in movies and television. The ones I've chosen are relatively accurate, but it is important to note that the videos focus on the type of student more likely to end up in college - namely someone with higher-functioning autism/Asperger's Syndrome - and as a result, should not be taken as being representative of the entire autism spectrum. I've pointed out some autistic traits shown in the videos for you to pay attention to; in doing so, it is my hope that you can get a broader, more three dimensional idea of what autism is. What to look for: Sensitivity to sounds/overstimulation, trouble controlling her own volume/pitch, and an explanation of stemming (rocking, twirling, etc). Note that there are up-sides to autism, such as seeing patterns and details other people may not. The added bonus is an introduction to one of the most influential speakers in the autism world, Temple Grandin, who is a very successful real-life woman in her own right. "Different, not less," by the way, is a theme you will find throughout this website. What to look for: Adam is very literal and very open - even blunt. He doesn't mean it in a bad way, but sometimes he may say inappropriate things ("Were you excited sexually? I was.") without realizing that they are inappropriate or that they cause discomfort to others. But you'll also notice he definitely has feelings and is interested in a relationship, which goes against the common myth that all people with autism are asexual. Done with this section? Move on to Understanding Autism: The Specifics to learn more about the characteristics of autism that are particularly important to understand, but whose connection to autism may not be immediately apparent. I recommend reading this article to everyone, but particularly recommend it to those who are close friends/roommates with someone with autism and to those who know someone with autism, but may not understand some of their "quirks." In addition, if you're interested in understanding autism in general more thoroughly, rather than the essence of autism and how it relates to college life, I recommend visiting my new website Autism Spectrum Explained. I made it because I noticed many visitors to the website were, in fact, more interested in understanding autism as a whole and had were neither in college themselves nor knew someone on the spectrum that was. As a result, the additional website has more general interest articles and generally conveys a deeper understanding of autism - you can check it out here. *This video clip has advertisements. The website does not support these advertisements in any way - they're just a hazard of being able to watch the clip.